Making great coffee is a real art and I was privileged today to witness a couple of fine baristas in action in an afternoon that was a lovely celebration of coffee and the skill and care which these people put into their art. Yes, coffee might not be the be-all-and-end-all to everyone but it’s always thrilling to watch people who are fabulous at what they do. Peter at Kaffeine was kind enough to invite me along. Kaffeine is a lovely cafe situated just north of Oxford Street in London and as well as serving the best coffee in London it’s also a friendly place with a stylish but comfortable interior with very tasty food too. Estelle Bright who works at Kaffeine and John Gordon (UK Latte Art champion 2009) were practising for their appearances in the UK Barista Championships. Both had a couple of 15 minute rounds to make and serve 4 espressos, 4 cappuccinos and 4 speciality drinks to the judges. There were 4 sensory judges (taste, smell, sight, service); 2 technical judges and 1 overall judge – phew, at least that’s what they have in official competitions. The intense, reverent hush during performances was noticeable. A large number of coffee afficionados turned up to watch. Naturally, I immediately had a cup of Kaffeine’s finest and enjoyed an afternoon of banter with the friendly bunch in the cafe. I never expected I might end up judging and it was a real treat to sit in a judges chair and enjoy sampling the great coffees that were made. I got to judge John’s espresso, cappuccino and stewed apple and espresso based drink – all of which were lovely. We had to score each drink on appearance (we were primed on what to look for) and taste and we had to score the baristas on their presentation. Interestingly, John used oolong tea as a palate cleanser between drinks. Estelle was charming in her performance and seemed quite at ease (though I know she was nervous) – I didn’t get to taste her coffees but I’ve tasted them often enough in Kaffeine to know she is very talented indeed. I did get to taste her espresso over homemade brandysnap syrup which worked very well. She served it with brandysnaps and marscapone. It was very cool to spend time with Peter and his lovely family and friends and to get to talk coffee and New Zealand with coffee consultant Glenn Watson. Three fun hours and I left very caffeinated having had an enjoyable time. Information can be found on the UK Barista Championships here. 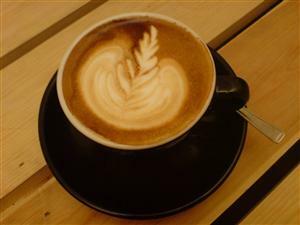 This entry was posted in eating and drinking, london and tagged barista, cappuccino, coffee, espresso, london. Bookmark the permalink. Amazing fun…I’m coming down now but I was like Hammy in Over the Hedge when I got home. TBH the coffees that you judge are all single shots so not as strong as normal and, as a judge, you don’t normally drink the whole thing – but the coffee was so good it was hard not to. Stop-press: The UKBC finals have now taken place. Estelle Bright made the final and John Gordon has now been crowned UK Barista Champion 2010.